The sixth annual Girls in STEM event will be held at Hudson Valley Community College's TEC-SMART extension center in Malta on Saturday, March 24. More than 300 girls in the Capital Region have already registered for this popular event, which has become a favorite annual tradition for many. Girls in STEM is a free educational event, which runs from 8:30 a.m. to 12:30 p.m., designed to give girls in grades four through eight an introduction to STEM fields and careers. The event features hands-on workshops facilitated by leaders and educators in STEM professions designed to illustrate the fun side of science and technology. This year's event will include 11 workshops, featuring topics such as sustainable energy, home and technology design, forensics and other sciences, and much more. Girls in STEM is being made possible through a collaboration between AT&T, Hudson Valley Community College, Saratoga County Prosperity Partnership, the Center for Economic Growth and other local partners. Congressman Paul Tonko will be in attendance at the event as well. "I am delighted to participate once again in this unique and valuable forum," said Congressman Paul D. Tonko. "In its first five years, Girls in STEM events have helped open doors of imagination and possibility for countless girls and young women in our Capital Region to explore careers in science, technology, engineering and math. Companies and cutting-edge researchers in these fields are desperate for the new energy and experience that can come from encouraging more gender diversity. Congratulations to the organizers for catalyzing this important opportunity for a sixth year." "AT&T's support for the sixth annual Girls in STEM program in Malta is part of the company's commitment to promoting STEM education for children at all levels," said Marissa Shorenstein, president of AT&T's Northeast Region. "At the same time, it aligns with AT&T's longer-term commitment to closing the gender gap in the technology industry disciplines in New York. We applaud the Center for Economic Growth, Saratoga County Prosperity Partnership and Hudson Valley Community College for spearheading this innovative, hands-on program." AT&T's support for this program is part of the company's legacy of supporting educational programs focused on STEM disciplines in New York through AT&T Aspire, the company's signature $400 million philanthropic initiative that drives innovation in education by bringing diverse resources to bear on the issue including funding, technology, employee volunteerism and mentoring. Aspire is one of the nation's largest corporate commitments focused on school success and workforce readiness by creating new learning environments and educational delivery systems to help students succeed and prepare them to take on 21st century careers. AT&T has given more than $103 million to support STEM initiatives since 1987. Projects supported by AT&T contributions range from after-school programs and camps for students at risk of dropping out to hands-on technology labs and elite robotics competitions. 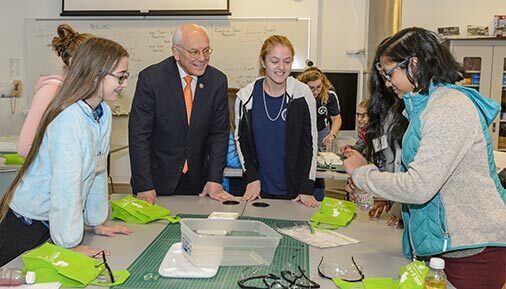 "Hudson Valley Community College is proud to host Girls in STEM at TEC-SMART again this year," said Penny Hill, Associate Dean for TEC-SMART at Hudson Valley Community College. "One of our top priorities is to create opportunities for students of all ages, including the next generation of high school and college students. Girls in STEM is a wonderful event that shows young girls firsthand the many different educational and career opportunities in STEM. Learning about those prospects encourages them to pursue the education that will allow them to make important contributions to the field one day." "The Saratoga County Prosperity Partnership is delighted to introduce young women to exciting and rewarding high-tech careers by once again supporting the Girls in STEM program," said Marty Vanags, President of the Saratoga Partnership. "Our continued involvement in this important initiative reflects our commitment to building a diverse workforce that will fuel future growth for the technology sector in Saratoga County and the Capital Region." "For the students who participate in Girls in STEM, this event is a fun introduction to what the future may hold for them in the science, technology, engineering and mathematics fields. For the Capital Region, however, this event is an important part of our strategy for fostering a more diversified and highly skilled labor force that employers today not only expect but demand," said CEG President and CEO Andrew Kennedy. "The Capital Region already has the state's third highest concentration of women employed in computer, engineering and science occupations, and our colleges and universities are awarding STEM degrees to women at a rate higher than the nation's. Yet we can and must do better, and for six years Girls in STEM has been has been helping us do just that." Programs like the Girls in STEM event are essential for youth, especially girls. According to the Bureau of Labor Statistics and U.S. Department of Labor, much of the growth in the domestic and global economy will come from STEM-related jobs – a highly lucrative and competitive field. It is estimated by 2020 there will be 2.4 million unfilled STEM jobs, with more than half made up of computer and coding careers, underscoring the importance of providing the youth the tools and skills necessary to compete in this innovation economy. The urgency for more STEM and computer science educated employees is accentuated by the low percentage of females who are currently employed at major technology firms and women pursuing bachelor's degrees for computer science, just 18 percent. According to research, women in STEM jobs earn 33 percent more than those in non-STEM occupations and experience a smaller wage gap relative to men. Increasing opportunities for women in these fields is an important step towards realizing greater economic success and equality for women across the board. TEC-SMART (Training and Education Center for Semiconductor Manufacturing and Alternative and Renewable Technologies), which is located on Hermes Road in the Saratoga Technology + Energy Park® (STEP®), features more than a dozen state-of-the-art classrooms and laboratories to train the workforce. In addition to housing classrooms for Hudson Valley Community College courses in technology, computer science, the liberal arts and business, the facility also hosts the Clean Technologies and Sustainable Industries Early College High School (ECHS) program, a collaboration with the Ballston Spa School District that educates more than 300 students from 20 school districts around the region. For more information, contact TEC-SMART at (518) 629-7075. For additional information or to talk to CEG President and CEO Andrew Kennedy, please contact CEG Director of Research and Communications James Schlett at (518) 465-8975 X221 or jamess@ceg.org. Founded in 1953, Hudson Valley Community College offers more than 85 associate degree and certificate programs in four schools: Business; Engineering and Industrial Technologies; Health Sciences; and Liberal Arts and Sciences; and an Educational Opportunity Center for academic and career training. One of 30 community colleges in the State University of New York system, it has an enrollment of nearly 11,500 students, and is known as a leader in distance learning initiatives and workforce training. Hudson Valley has more than 80,000 alumni. The Center for Economic Growth (CEG) is the Capital Region's primary regional economic development organization, with over 230 investors in business, government, education, and the not-for-profit sectors. CEG is a New York Empire State Development Division of Science, Technology and Innovation-designated Regional Technology Development Center and an affiliate of the National Institute of Standards and Technology (NIST)/Manufacturing Extension Partnership (MEP).